The African fish eagle is a magnificent bird with a wingspan of up to 8 feet. They can be seen perching near rivers and lakes throughout much of Sub-Saharan Africa. We were driving beside a small stream in a remote corner of South-West Tanzania when we came across this bird feasting on a freshly caught fish. 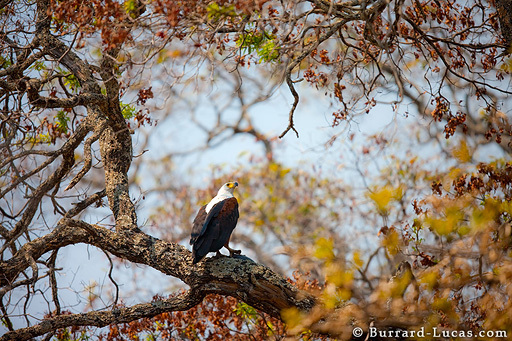 As we got closer, the eagle flew into the canopy where it was framed beautifully by the surrounding foliage.